It’s prime touring season, the perfect time to head out on two wheels for a long trip. Whether you are making a day-trip to the Gorge or riding cross country with the kitchen sink, you are probably going to find yourself far from a bike a shop and in need of a tool kit to fix the occasional flat tire. So, aside from gathering together the essentials—a patch kit, tire levers, a spare inner tube and a multi-tool—you are inevitably going to need a means to inflate your tire once you have fixed it. For this I recommend one of the Morph series travel pumps from Topeak. Having used the Road Morph G pump model both for commuting and long distance touring, I can positively say that this is the best travel pump I have ever used. Its most appealing feature is the 360 degree rotating hose that connects the pump head to the pump body. Most travel pumps, including some of Topeak’s lesser travel pumps, have a pump head directly attached to the pump body which, when used, causes excessive lateral strain on your tire’s valve which in turn can lead to an un-patchable rupture in your inner tube or a broken valve. The flexible hose on the Morph models negates any lateral valve movement from pumping. This feature, combined with a fold-out foot pad and a compact gauge on the “G” models, allows one to use these pumps almost like a standard floor pump. 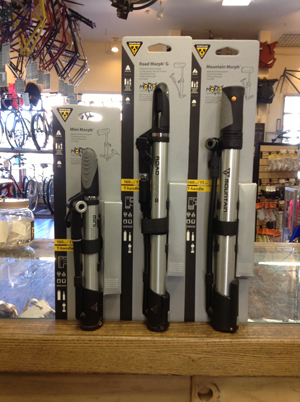 Most importantly, like a standard floor pump, Topeak’s Morph series pumps are also capable of reaching your bicycle tire’s maximum air pressure—a feat many travels pumps can not accomplish. However, given their compact size and relative light weight I would not recommend using a Morph pump as your everyday floor pump. Rather use it only for road-side repairs or for topping off your tires while on tour. My one criticism of the Morph series pumps is that they do not lend themselves to being repaired as well as Topeak’s full sized floor pumps. Having had to replace a part I once lost on a ride, I found that Topeak’s pump repair kit lacked the piece I needed. The lesson here: Always turn back when you hear something fall off your bike, regardless of how fast you are going. As I alluded to earlier, there are a number of models in the Morph line. At the Community Cycling Center we carry the Mini Morph, the Mountain Morph and the Road Morph G. The Mini Morph is the least expensive and is gauge-less but can easily reach over 120 PSI. The Mountain Morph has a larger air chamber making it best suited for higher volume, lower pressure tires and is also gauge-less. Finally, the Road morph is similar to the Mini but has a longer chamber for improved air volume per pump as well as a compact gauge that will give a decent, albeit un-precise, pressure reading. All Morph pumps will accommodate Schrader and Presta valves and come with a handy mounting bracket that can attach to a pair of water bottle braze-ons. Enjoy these summer months and I hope you all find yourself riding somewhere far from any bike shop.